According to the Catholic Encyclopedia, there are at least three Saint Valentines. They lived in the early days of the church and all died martyrs. Few of us are called upon to lose our lives for our faith. Each of us, however, is commanded to sacrifice on behalf of our brothers and sisters in Christ. Thank you for your own sacrifices that help keep our mission signal strong. Words fail to express our gratitude. “DUSTY” DUSK: By January 12th, Nome had seen so little snow that for the first mid-winter in 30 years, it was possible to drive a truck to the transmitter building’s front door! In the photo, you can see the flat - and in spots bare - driveway in the lower left. 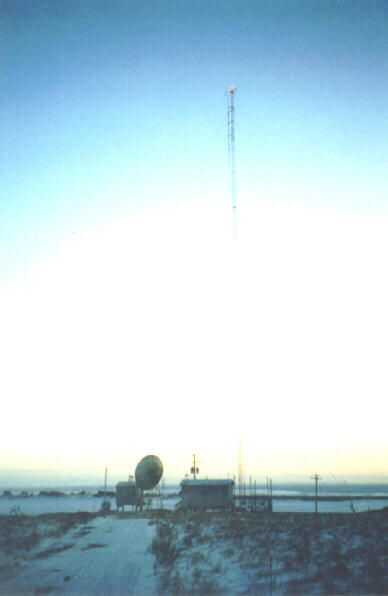 The final rays of the sun silhouette, from left, the emergency generator building, a satellite dish, our transmitter building, and KNOM’s 230-foot tower, 3.3 miles east of Nome. A week after this picture was taken, a string of blizzards dumped tons of snow. By the end of January, it was drifted up to twelve feet in spots. That’s not a lot by Nome standards, but it did finally close down the transmitter drive. And so, until May, engineer Les Brown will have to trudge through knee- and hip-deep snow for the final 400 feet from the gravel highway. top KNOM beams God’s Love throughout isolated western Alaska. We inspire, inform, educate, entertain and are a positive, supportive companion to villagers throughout 100,000 square miles. We are on the air to beam the Mass and the Rosary into far-flung points that may see a priest only occasionally, to lessen the horrors of alcoholism, poverty, suicide, violence, and diseases like hepatitis and tuberculosis. 500 MILES AWAY FROM HOME: In January, office assistant Connie Albers flew to the “big” city of Anchorage for the final month of her pregnancy. While Connie and the unborn baby are healthy and normal, the local docs wanted her to deliver the child where good medical care is available. THE EXPEDITION THAT WASN’T: Northwestern Alaska had so little snow that the 78-mile gravel road from Nome to the village of Teller was open, for the first January in thirty years. An extremely cold and dry December had frozen the salt water of Teller’s Grantley Harbor unusually hard and smooth. These twice-in-a-lifetime conditions prompted two dozen Nome adventurers to schedule a caravan of pickup trucks to Teller. From there, they planned to drive another 35 miles on the bare ocean ice to Lost River, a remote never-developed tin mine that few people have ever visited. Pilots reported that the ice was driveable all the way to the village of Wales, at the tip of the Seward Peninsula. Wouldn’t you know it? Two days before the January 15th adventure, blizzard winds tore the ocean ice, rendering the trek impossible. And, God is continually blessing me with the ability to work, and blessing my family with nutritious food to eat, warm clothes to wear and a loving home. 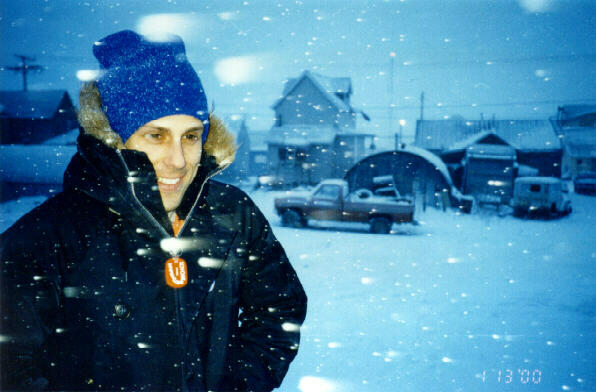 top 30 YEARS AGO: February 2, 1970, Philadelphia-born broadcast engineer Tom Busch, fresh from Boston College, arrived in Anchorage, en route to Nome. Tom’s volunteer task was to design the mission radio station and supervise installation of the electronics. The evening of February 8th, Tom was one of 3 passengers on an Alaska Airlines 727 that landed in Nome. 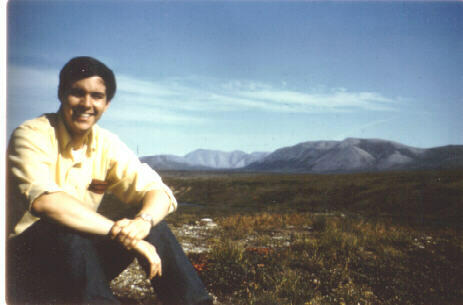 (Left) In the summer of 1970, a young, slim, dark-haired Tom Busch sits on the tundra. for many years into the future. KNOM news director Paul Korchin behind the studio building. In the following week, Nomeites dug out steps and walkways four times. It took six hours for Tom and Florence to shovel out their house. The satellite dishes need sweeping now, the streets are piled high with snow berms, and there’s no doubt that winter is here! KEEPING CURRENT: In the teeth of a raging blizzard January 22nd, the power lines to our remote transmitter site went down. With heavy snow falling (sideways!) in hurricane-force winds, visibility was zero. Crews couldn’t get to the scene of the break until the wind began to quiet over sixteen hours later. Our emergency generator started immediately, and came up to speed in six seconds, returning us to the air. It worked perfectly and without complaint throughout the entire outage. Thank you to everyone who contributed toward this generator two years ago. It kept our signal alive...and today, it remains on vigil. It will be needed again. INSPIRATIONAL SPOT: For every burden that we bear, for every sorrow, every care, there is a reason. For every grief that bows the head, for every teardrop that is shed, there is a reason. For every hurt, for every plight, for every lonely painracked night, there is a reason. If we trust God as we should, all must work out for our good, because He knows the reason. full size COMING TO OUR CENSUS: KNOM volunteer Michael Warren flew to Unalakleet (YOO-nah-lah-kleet) on January 20th. The U.S. Census chose this remote town’s 82-year-old Inupiat Eskimo elder Stanton Katchetag (CATCH-eh-tag), for the nation’s first head count. VERY FINE: (left) Yes, Nome’s ever-present mineral dust is extremely fine, and passes right through most air filters. Although the air filtration system in the KNOM studio greatly reduces the dust, some does sneak through. 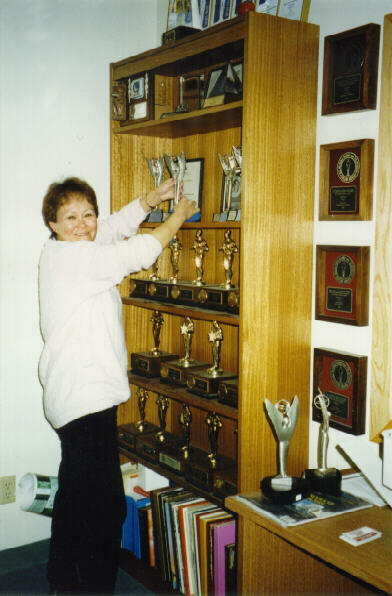 Here, business manager Florence Busch takes the time to clean the awards cabinet in our studio’s front office. People are like the driftwood we gather. Some wood looks good on the outside but turns out to be wet or rotten on the inside. Some wood that looks ugly on the outside turns out to be the kind that gives the best heat. The lesson is that we cannot judge people by the way they appear on the outside. top PLEASE TELL US YOUR OPINION: Right now, KNOM broadcasts with 25,000 Watts during the day, but the FCC rules require us to drop to 14,000 Watts when it’s dark. During the winter, that darkness is 20 hours a day. Alaska broadcast pioneer Augie Hiebert, who helped Father Jim Poole put KNOM on the air, thinks there may be a way to increase our night-time power to 25,000 Watts. It may not be possible, but if it is, our winter signal will improve dramatically. However, such a power increase would increase the mission’s power bill by about $12,000 a year. Do you think we should go for it, or be content with our present power? Please let us know what you think. And once more, thank you for your prayers and financial support for our mission. God bless you! Copyright 2000 KNOM. All rights reserved.